This PDF 1.5 document has been generated by / Skia/PDF m57, and has been sent on pdf-archive.com on 19/01/2017 at 14:05, from IP address 145.89.x.x. The current document download page has been viewed 134 times. File size: 891 KB (27 pages). A good newsletter – How is it constructed? people who have their doubts about where the money goes. contributors to this beautiful NGO. corrected. Even a small typo lowers the quality in the eyes of possible donators. work. Fix PayPal and you’re good to go. be used for Instagram as well) to this section. approach”. They should be also refreshed more often. newsletter is a perfect tool. distributed and mainly about the topic that subscribers are interested in. be a small gift to donators – if you make it interesting. points and advices you should take into notice before making your own newsletter. At first you have to ask yourself: Why am I making this newsletter? What is the point of this? What I want to tell and what I want to profit by distributing a newsletter? After you have answered the questions, you can start. your newsletter is working. There is different software that provide data tracking. the letter with your name, not the foundation, your own name. is just going to be forgotten in the subscriber's email box. there is something they are interested in, make it easy for them to find. We recommend that the newsletter should be distributed every second Wednesday evening. mail. If not posted frequently enough, people may forget about it and lose interest. Three key points and a summary. 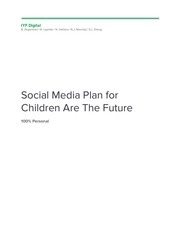 you simply Google on: Children are the Future, the company isn’t even on the first page. Google is a key aspect for a company with a strong yet often used name. be constantly updated and sending the same basic message. This file has been shared by a user of PDF Archive. Document ID: 00539203.